This is a post about one of my customers. 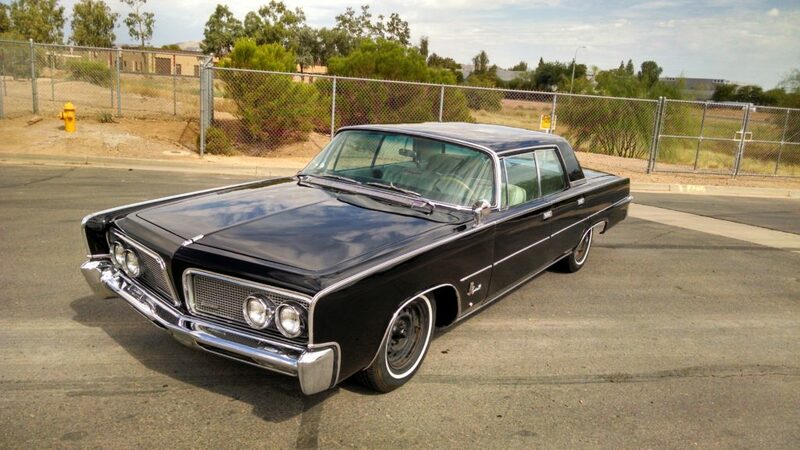 He has a 1964 Imperial (beautiful car) and recently had to replace the power window motor in the driver’s door. It’s a problem I’ve run into before, but always have to go to the drawing board to solve. Hopefully this helps anyone who is facing a similar problem. His problem was, the old motor had two connections for power and was internally grounded. Depending on which connection received power, the motor ran clockwise (CW) or counter-clockwise (CCW). The new motor requires both power and ground to run. In order to switch between CW and CCW, you have to switch the power and ground wires. Modern DC motors, that require both power and ground, use a Double Pole Double Throw (DPDT) switch with a center “off” position. 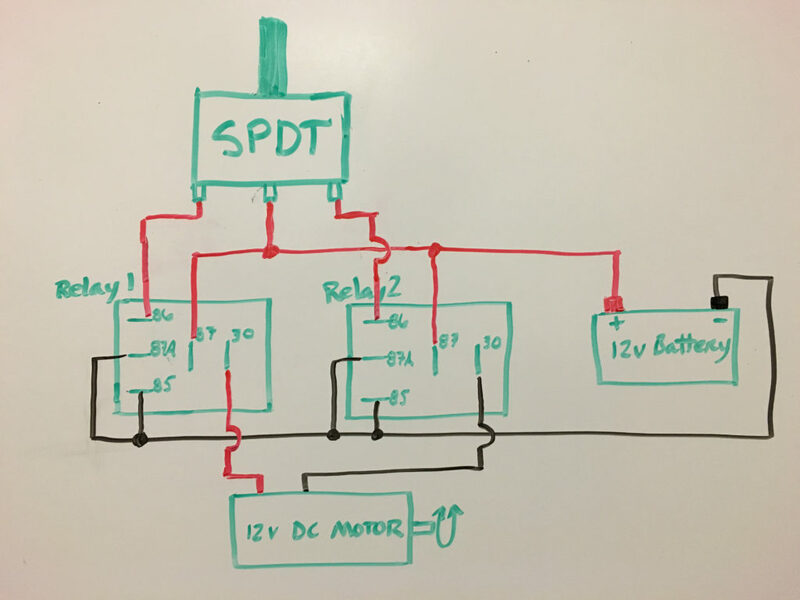 The old DC motor only required a Single Pole Double Throw (SPDT) switch. Some guys just hide a second set of DPDT switches under the front seat and leave the old switches unplugged. Naturally, this being a classic car, he wanted to keep both the look and the function of the old switches. 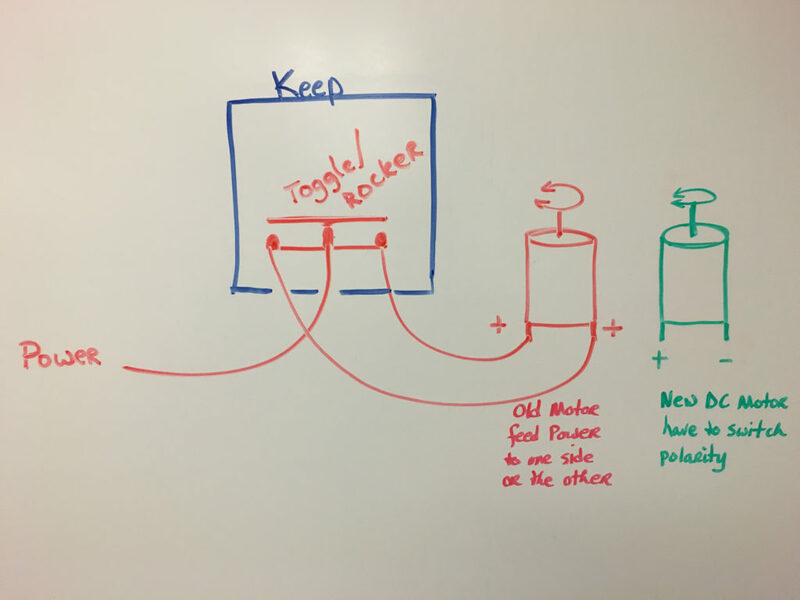 So, this is how you make a SPDT toggle act like a DPDT toggle and control a DC motor in both directions. 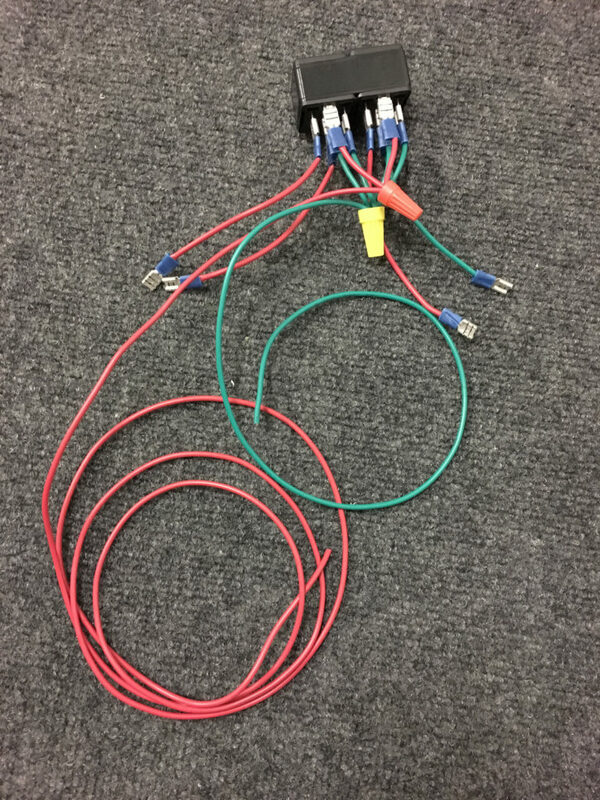 You’ll need two 5 Pin Relays to make this work. Wire one relay to each of the motor contacts so that by default they are sending “Ground” to the motor. Then wire the relays to the SPDT toggle so that when one of the switches receives power it sends “power” to the motor while the other switch is still sending “ground”. Here are the relays all wired up. Here are the relays wired into the car. What’s great about this solution is, you can keep the original SPDT toggles and make use of modern DC motors. 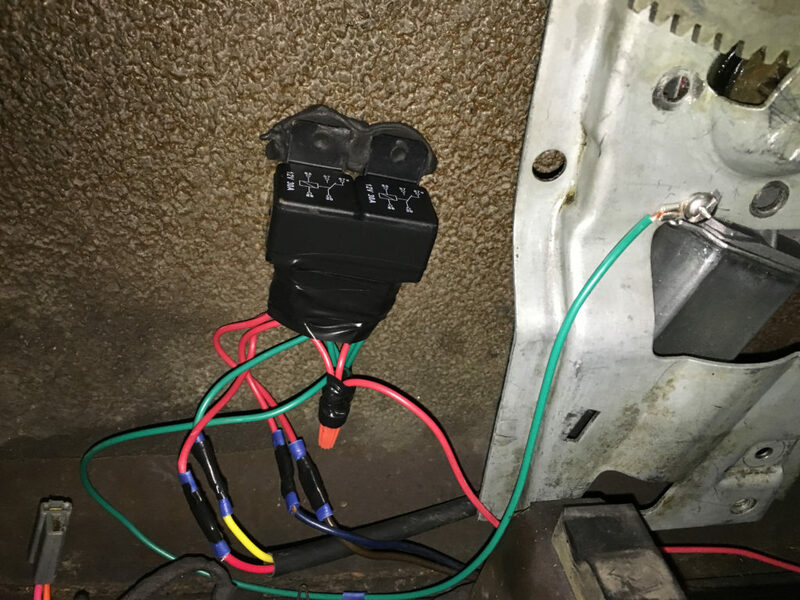 Since the relays are wired to the motor, and don’t change the wiring to the rest of the car, this will work the same on the passenger’s door and allow both switches to operate the window with no extra work. Spark Plugs are an important part of maintaining performance and functionality in your vehicle. Think of spark plugs as a tiny bolt of lightning. They create a spark of electricity that ignites a mixture of air and fuel in the combustion chamber. This explosion puts the engine’s pistons in motion. When spark plugs start to deteriorate, you may notice your vehicle is not performing how it should. Here are some signs that you may need to change your spark plugs. Maintaining your vehicle is extremely important, especially in the Phoenix heat. Regular maintenance is essential to keep the vehicle running smoothly and also helps to hold the value of your car. Not to mention, if you don’t maintain your car then repairs can get expensive and it’s just not worth the hassle. Here are some tips on what to lookout for when doing regular checkups. It’s that time of year again, when Phoenix residents brace for the heavy rain, high winds, and magnificent lightning storms. During the Valley’s seasonal monsoons, getting behind the wheel can be dangerous, especially if your tires are not up to par. Slippery roads, unexpected wind gusts, flooded highways, and poor visibility all contribute to the dangers of driving with low treaded tires. Here’s some tips you can follow to make sure, your tires are ready for the monsoons and you’re safe on the road. Many people have questions about the 3 different grades of gas you find at a gas station. As the old adage goes, you get what you pay for. So, it’s logical to think that premium gas is better for your car. The octane rating of gasoline defines it’s resistance to combustion. A gasoline engine works by spraying a fine mist of gasoline into each cylinder, compressing the air and gas mixture and then igniting it with a spark. Service Techniques is perfectly located between Chandler, Ahwatukee, and Tempe. Expert auto repair for 85226, 85044, 85284, 85224, 85225, 85286, 85248, 85249, 85233, 85283, 85295, 85297, and 85298.